Pronounced “eh-puh-ZOE-tay,”, if you are a fan of Mexican food you will appreciate the taste this herb can bring. 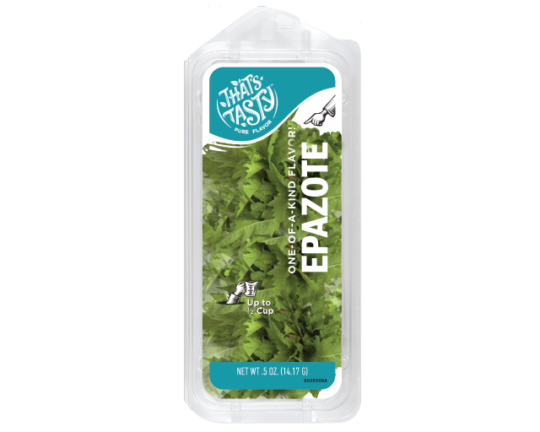 Epazote has an aromatic and assertive flavor that is wild, peppery and minty. (Sort of like cilantro on steroids.) It adds a wonderful dimension to all Latin food, grilling, marinades, and curries. Sold at the peak of freshness. Our epazote is grown and sold to be used right away for the best flavor. A recipe using this herb plus beans and chiles make for the ultimate three amigo ingredients. “Triple the amount you would use for dry herbs and add just before serving. Epazote is happiest inside its package, hanging out in your refrigerator drawer. Store fresh Epazote in refrigerator for up to 1 week. It is still fine to cook with even if it looks a little wilted. Dry entire leaves and store in sealed containers in a dark place. To release flavor, crumble leaves finely just before using. Freeze epazote, whole or chopped, in ice cube trays filled with water.